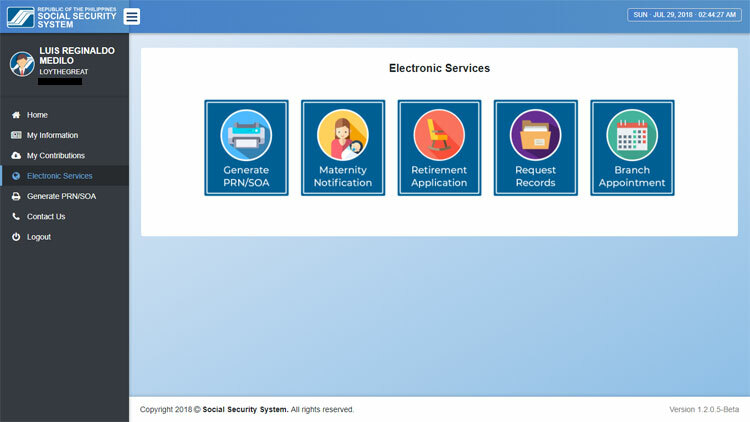 The Social Security System (SSS) has recently created a new member portal to keep up with the fast-changing times. As we all know, the old My.SSS portal is clunky and incompatible with newer browsers like Google Chrome. 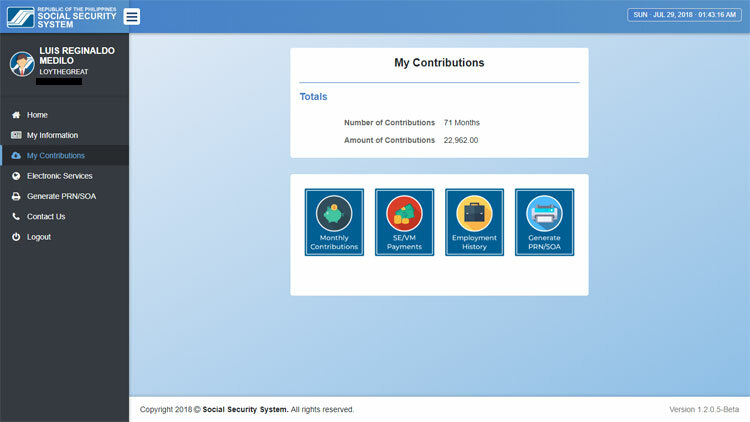 This new SSS member portal has a clean interface, works well on modern browsers and is also mobile-friendly. The new SSS member portal is currently in the beta stage, so don’t expect it to run smoothly and without any problems. 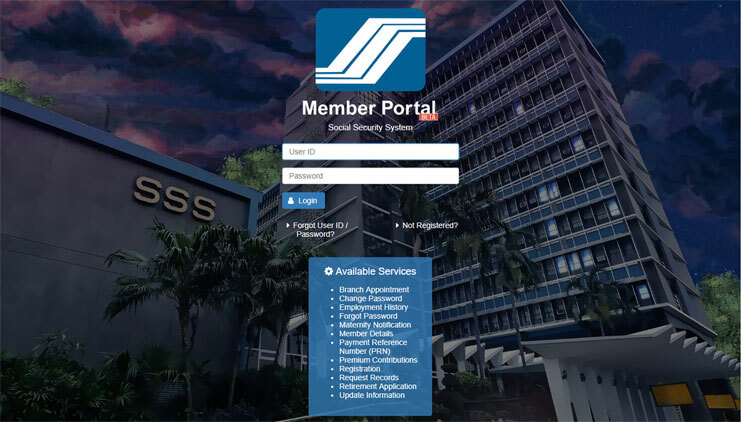 The old SSS portal is still usable so you can use it if you’re not yet familiar with the new portal. I know that there are millions of SSS members who can’t wait to use the new SSS member portal, but for those who are not very Internet savvy, I’ve come up with a short guide on how to use this new portal. The old portal will eventually be phased out, so it’s important to get yourself familiarized with the new system. 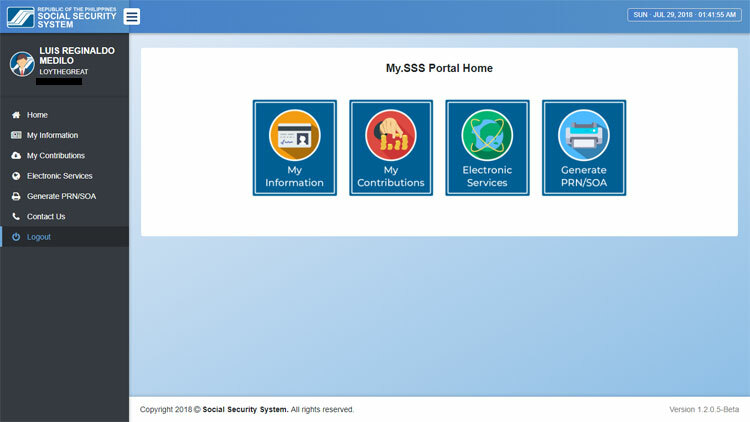 Open the new SSS member portal by going to https://portal.sss.gov.ph. Click the Click Here to Enter button. Upon logging in, you will see four boxes, namely My Information, My Contributions, Electronic Services, and Generate PRN/SOA. Links to these sections can also be seen on the left-hand menu. The My Information page is where you can see your membership information, and a link to edit your information. The My Contributions page is where you can view information about your monthly contributions, your self-employed/voluntary (SE/VM) payments, and your employment history. The Generate PRN/SOA page is where you’ll get your Payment Reference Number (PRN) and print a Statement of Account (SOA). We’ll delve into each page deeper in the next section. 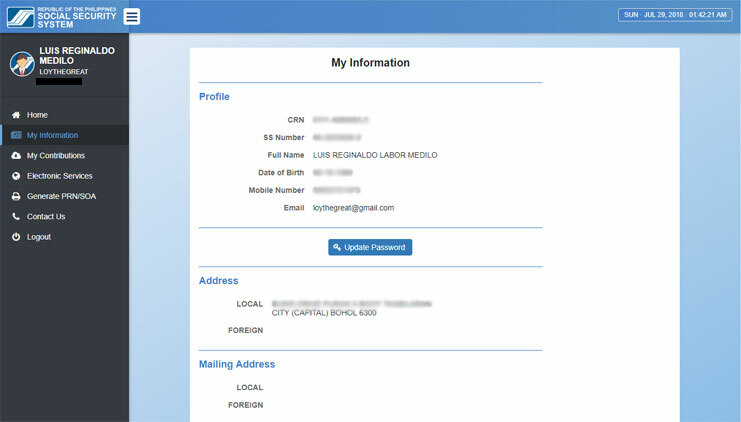 The My Information page allows you to view your SSS membership information and change your password. There’s also an Update Information button at the bottom of the page; clicking it will direct you to a page where you can edit your contact details and mailing address. The My Contributions section is where you can see a running tally of all your contributions. You can also see the total amount you’ve paid since you became a member. Click the Monthly Contributions box to see all the payments you’ve made from the beginning. Click SE/VM Payments to see all your self-employed or voluntary member payments, if you’re self-employed like me. Click Employment History to view your employment records, including the employer ID number, employer name and date of employment. In this page, you can access several electronic services such as generating a Payment Reference Number (PRN), submitting a maternity notification, applying for retirement, requesting records, and scheduling a branch appointment. If you’re ready to retire, click Retirement Application to submit an online retirement benefits application. if you’re pregnant and want to apply for maternity benefits, submit a Maternity Notification. You will also see the status of your past record requests. Click Branch Appointment to set an appointment with your SSS servicing branch. You will need to set an appointment for salary loan, funeral claim or disability claim application, SS card enrollment, member’s data change (E4), issuance of certification, complaints, and other matters. Effective January 16, 2018, the SSS has implemented the Electronic Collection System (e-CS) to facilitate the real-time posting of SSS contribution payments. Individual members (self-employed, voluntary and OFWs) are required to use a Payment Reference Number (PRN) when paying their contributions. In this page, you can see your PRN, applicable period, total amount due and due date. Click the Print PRN/SOA button to generate your Statement of Account (SOA) which you will need to present when paying your contribution. You can also click the Edit PRN/SOA button to change your membership type, applicable period and monthly contribution. Don’t forget to log out of the SSS member portal by clicking the Logout link at the left-hand menu. This is important if you are using a public computer to prevent other people from accessing your account. I hope that you will find this guide useful. I will be updating this article from time to time to reflect future changes in the new SSS member portal.